You are currently browsing articles tagged Sierra Papacal. From March 5th through the 12th, students across the United States were celebrating their Spring Break. Many of them planned to catch up on some much needed rest. 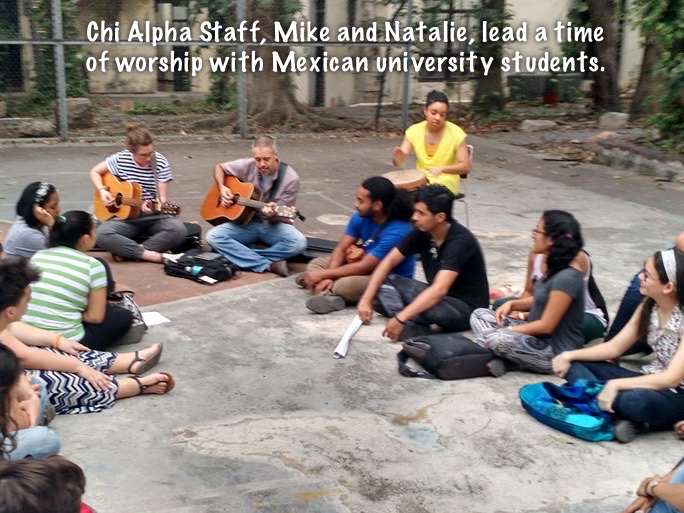 Others were on their way to more exotic destinations, but one group of students had different plans. Sure, they started out as many of their peers, making their way from Dulles International Airport to Cancun, but the rest of their itinerary was drastically different. 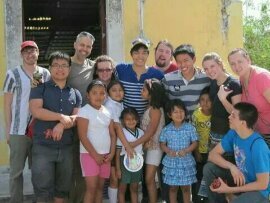 They skipped the parties to take up paint brushes and cashed in their chance at sleeping in for the opportunity to spread some joy to the people of the Yucatan. 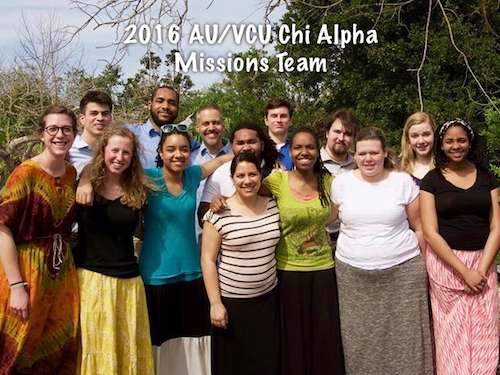 Yes, just last week we had the pleasure of hosting a combined Spring Break team of Chi Alpha students from American and Virginia Commonwealth Universities. 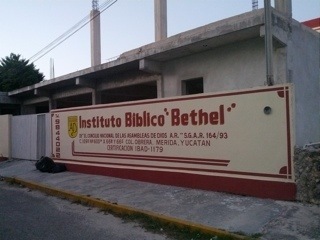 The team of 14 students and staff, including my twin brother Mike, worked together with Bible school students at Instituto Bíblico Bethel to advance our construction project and give the existing buildings a much needed fresh coat of paint. 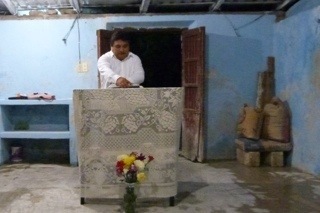 They ministered in area churches, blessing congregations with their songs, skits, testimonies, and messages. 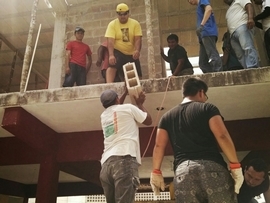 They also spent time in Sierra Papacal, preparing the church land for upcoming construction while hosting services for children and adults alike. But these Chi Alpha teams are valuable for more than what they leave behind, be it roof raised, or a wall painted, or a service celebrated. 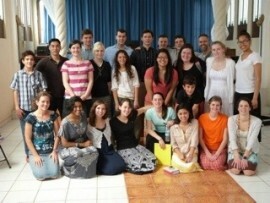 They serve as catalysts for new and continuing ministry. Through our eight years working with short term missions trips, we’ve seen how they’ve facilitated pivotal relationships with people that we count as partners to this day. We’ve watched as their foreign investment has encouraged nationals to move forward to complete the work they they had begun, and we’ve witnessed how their example has been emulated by others who have been touched by their ministry. This trip was no exception. Interested in investigating the situation of students in secular universities in Mexico, Mike had asked me if I could coordinate a time of prayer and fellowship with a group of students on a local college campus. We held a meeting at the School of Architecture that was to last for only two hours. Instead, it stretched to more than three as the blended group of students worshiped together, encouraged one another and prayed for each other. 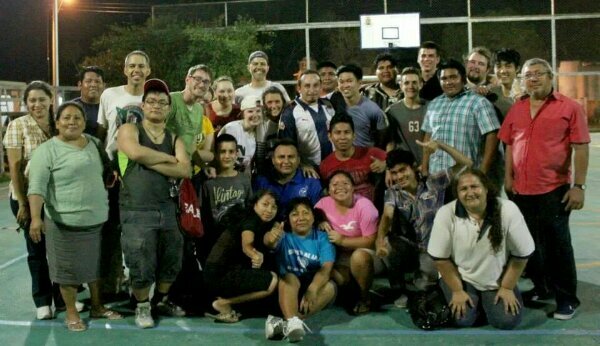 Come to find out, it was a shot in the arm for the campus fellowship that we visited. Having gone through a time of transition, they were having difficulty meeting and were at the point of disbanding. Rosy, a university employee who had been serving as a sort of sponsor for the group, thanked God for the timeliness of their visit and expressed a renewed vision for rejuvenating the flagging ministry. So 14 students returned home last Saturday, perhaps a bit worse for the wear–maybe walking more slowly across their campuses or dozing in some of their classes. 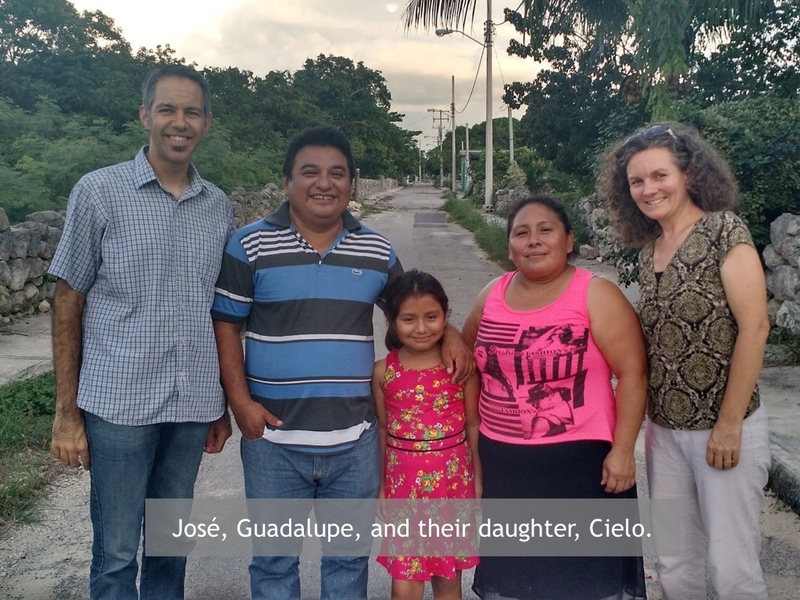 It’s to be expected; they didn’t have a vacation, they were participating in catalyzation, and we along with many others here in the Yucatan are grateful that they did! It was Tuesday afternoon. I was sitting in the hospital trying to take it all in. We had planned the most ambitious Chi Alpha Spring Break Missions Trip we had ever undertaken: two teams from American University and the University of Virginia, construction, community outreach, and evangelism, Mexicans and Americans working together. But at that moment, everything seemed to be unraveling. Six of the 20 team members were sick, 5 had received antibiotics and one was hospitalized. Instead of working to meet our goals, I seemed to be scrambling to avert disaster. But God, who makes all things work together for our good, never stopped working, not even on that Tuesday afternoon. The work never stopped. 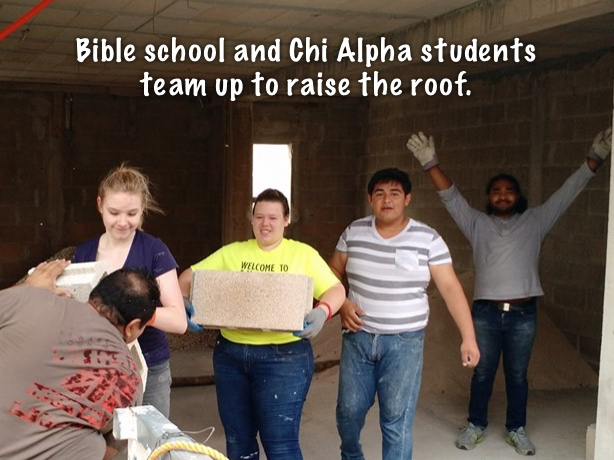 The Chi Alpha teams, working together with students from the Bible Institute, raised six columns of the second story structure of the Institute’s new multipurpose building and painted the entire first floor. 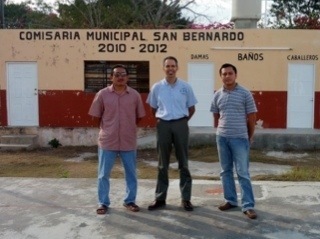 They also collaborated to beautify the communities of Sierra Papacal and San Bernardo, painting the walls that lined the main streets of the villages. It was beautiful to watch how those who might not otherwise had asserted themselves rose to the occasion to keep things on track. 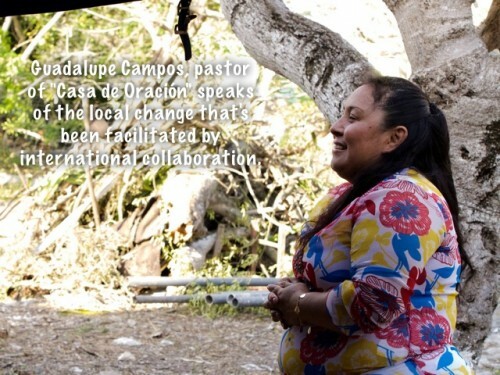 We were deeply moved as even local pastors who had heard of our situation arrived to help us to achieve our goals. 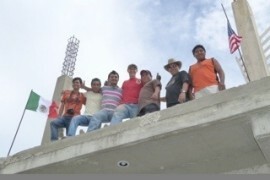 Not only was the work done, but our planned outreaches took place as well. 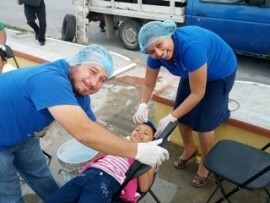 By Thursday, our teams, including those who had been sidelined by sickness were up and active, coordinating a social outreach that saw dozens of kids deloused and taught dental hygiene while moms were able to select from new articles of clothing for their families. 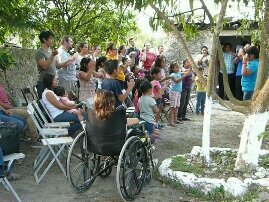 Following the social outreach, evangelistic services took place, where children and adults alike were able to hear and respond to the message of salvation. Reflecting upon the trip, it became clear that it was through the adversities that we faced that the work became a group effort. Those of us who had arrived looking to put forth our best efforts found, through our weakness, a new found interdependence within the international Body of Christ and a renewed reliance on the power of the Holy Spirit to sustain, to heal, and to accomplish His will. Spiritual gifts were utilized that would have otherwise remained dormant. Friendships were formed which otherwise would never have been possible, and our celebration of the work was correctly shifted from what we had accomplished to what God had done in our midst. On the Saturday before the teams arrived, the song, “He makes Beautiful Things” had been playing in my head. The chorus of the song repeats, “He makes beautiful things out of the dust. He makes beautiful things out of us.” Although it was difficult to see on that Tuesday afternoon, God indeed worked our adversities together for our greater good. He created something beautiful even out of us. Have you enjoyed this Spring Break Report? Be sure to check out our photos as well!